New High-Tech, High-Definition cameras enable viewers to see the power of sharks in ways not possible until now. Off the coast of South Africa, massive one-ton great white sharks blast from the water at 25 mph, with almost no warning, to pull a sneak attack on the seals that congregate there. Ten years ago, Discovery Channel premiered AIR JAWS which explored this phenomenon. It was an instant hit that still remains the fifth most-watched SHARK WEEK special of all time. But that was before HD. Now, producer Jeff Kurr goes back to the scene to investigate the aerial attacks armed with state-of-the-art equipment in the one-hour special ULTIMATE AIR JAWS, kicking off cable's longest-running event - SHARK WEEK 2010 - on Sunday, August 1, 2011 at 9 PM ET/PT. Using the very latest in technology, including an HD camera that shoots in super slow motion - 2,000 frames per second, or 20 to 30 times slower than "typical" slow motion footage . Kurr and shark expert Chris Fallows slow down the footage of a breaching shark from one second in real time to almost a full minute. The unparalleled resolution provides so much detail that you can literally count every tooth in the shark's mouth. Fallows and Kurr also employ a submarine and remotely operated helicopter to capture this incredible footage. 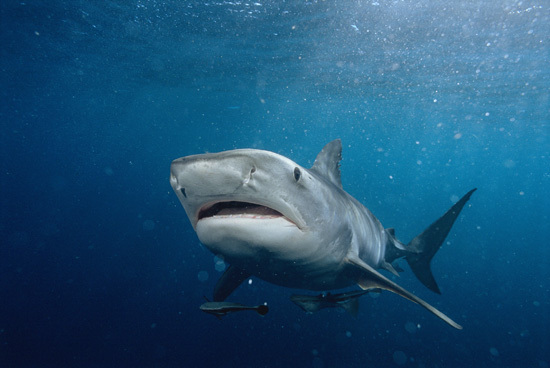 Technology also plays a key role in INTO THE SHARK BITE, a special where viewers can watch the power of a shark bite filmed with the latest high-speed, high-definition cameras from extraordinary angles - ending up literally inside the jaws of sharks. Also in this year's SHARK WEEK, find out how shark attacks can happen, and what you can learn to do so that neither you nor the shark gets hurt; learn valuable lessons from six people who survived shark attacks, and hear why they don't blame the sharks; hear what happened in 2008 when fear gripped beaches along the coast of California and Mexico in the wake of several horrific shark attacks and search for clues that might explain why sharks mistook four people for prey that fateful month; and dive through some of the most jaw-dropping moments from past SHARK WEEK specials to learn amazing shark feats, shark facts and shark science. Hosted by SURVIVORMAN’s Les Stroud, SHARK WEEK’s 20th Anniversary will fill Discovery Channel’s total day schedule from Sunday, July 29, through Saturday, August 4, from 9 AM to 3 AM (ET/PT) each day  adding up to over 130 hours of shark programs devoted to the behavior of one of the most mysterious and majestic creatures on the planet. Also to be featured is a programmed-by-you Viewer’s Choice hour at 8 PM, and eight all-new primetime specials at 9 PM. For the past two decades, SHARK WEEK has intrigued, educated and enthralled viewers.